Containerization is the process in which 40’ intermodal containers are loaded and sealed for transportation via ocean vessels, rail, or semi-trailer trucks. Containers are individually scaled to confirm they adhere to container, destination country, and highway weight restrictions. During scale operations an electronic photo with time and date stamp is also recorded as part of our continued quality control. A dispatcher coordinates transportation to the closest Pacific coast port: Long Beach, Tacoma, or Seattle. Logistics is carefully managed to meet on-time vessel cut-off dates. Availability of equipment and weather may impact scheduled bookings, but this is controlled as much as possible to reduce impacts to clients shipments. Export documentation is the final stage in the process. This critical last step brings together the sales agreement, container contents, vessel details, and payment terms to conclude the transaction. 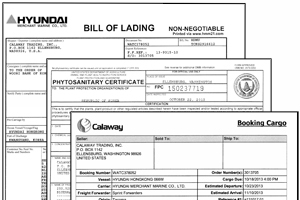 Original Bill of Ladings (OBLs), Seaway Bills (SWBs), Phytosanitary Certificates, country specific export forms, packing lists, and commercial invoices are prepared to ensure timely payment notification to ensure customers can pick-up their containers at destination ports. Letters of Credit are often used as payment instruments so the documentation team reviews each one to ensure all documentation submitted meets the issuing and reimbursing bank requirements.